Last night a few readers noticed that there was an awful lot of gang loitering on Wilson near Racine, in front of Jimmy John's. We encouraged them to write to the 19th District CAPS Office to let them know. 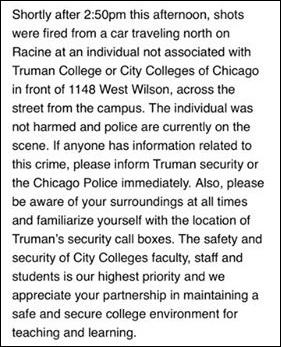 Today we received this from Truman College saying there had been shots fired near that location. Please call 9-1-1 if you see anything suspicious or if you know anything that would help them with this incident. Why don't the business owners/managers call the police if there's loitering? Definitly not good for business or neighborhood safety. its unbelievable that after all this time there are still gangs in/around Truman. Are they part of the student body? Where are they coming from? The City is heavily recruiting CPS students (from where?) to go to the City Colleges because of low enrollment. The colleges need students! And why haven't these businesses hired private security? As a customer I wouldn't go into a business if I saw a bunch of jackasses hanging around outside. It's bad for the business. I would assume Snack 4 Less won't call due to these kids being most of their business. The same kids are always out up to no good. CPD needs to have patrol on foot on Wilson. It's a given hot spot and if there is a cop they just sit in the patrol car playing on their phones. Stop and frisk would do a lot of good for Wilson. Police cannot stop and frisk anymore. It is a violation of the persons civil rights. Unless said persons were observed committing a crime, about to commit a crime or, are fleeing from an observed crime police cannot clear the corners anymore. The Justice dept.and A.C.L.U. Investigated the Chicago police for an entire year and claimed that the stop and frisks were illegal. Now, if an officer does stop anyone for whatever reason they must complete an I.S.R. Report (individual stop report) on each person stopped. They must document in the narrative why they stopped said persons. This report is sent to the ACLU where it is reviewed by their attorneys making sure the stop was valid. If it doesn't meet the legal criteria for a valid stop the officers open the floodgates to be sued, disaplined by the police dept. This report is now only a page and a half long ,down from two pages. The days of policing that you entertain in your thoughts are long gone. Officers are not going to put their careers, finances or reputations on the line for a stop. On the street or in a vehicle. The powers that be wanted a dept. with no teeth. Now they have it. Most officers are remaining fetal. They answer their calls, write proper reports for crimes committed, and back each other up on calls. Just the bare minimum. I'm sorry to see it.